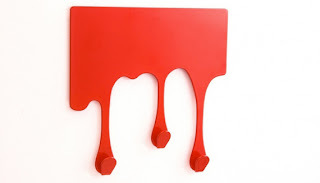 Ashbee Design: Drips can be fun! Here is an age hint. In my day, drips was the term we used for dorks. Drips were not fun to be around. Terminology changes and now drips can be fun. These hooks are definitely fun! This set is available through Incredible Things but I look at it and see it as a DIY inspiration with a piece of plywood, a saber saw, sandpaper and bright glossy paint. Picture a row of these under a storage shelf in the mudroom.